I picked her up in my old green Jeep. The passenger side had a faulty seat belt, but I knew that wouldn’t bother her. She was an up-for-anything kind of woman. We had mutual friends and I was lucky for it, because here was a famous author whose books had impacted me in my 20s, a woman who made me want to be a writer. Now we were both in the same town for a book festival. My first book was six months away from landing in bookstores. I emailed her ahead of time to ask if we could meet for an hour to talk. Long shot. She actually said yes. In the parking lot of the Holiday Inn, my breath held. I may as well have been picking up the Queen of England. I reminded myself she was just a human like me. I knew that meeting a s/hero can often lead to disappointment. She got in the car and off we drove to get coffee. Immediately, I could sense her irritation. Her shoulders were slumped and her face had that faraway look on it. At least she was real and not pretending. I did what I do best and asked thoughtful questions. She explained: The night before, at the event where she spoke to a large audience, the bookstore ran out of her books and her fans had nothing to buy. Of course, the two male writers who spoke with her seemed to have plenty of books on hand, even though fewer people wanted their books. It sounded like this wasn’t the first time. She told me she’d been up all night crying about it. “That’s horrible,” I commiserated, even though, as a young writer, I couldn’t really understand the scope. She and I were stars passing each other for a short afternoon and there was something for each of us to learn there. We ordered coffee and sat down. Within minutes, I was rifling through my purse for a Ziploc bag of crackers. To out my strange behavior, I shared, with no fanfare or expectation of a response from her, that I was 12 weeks pregnant and overcome with constant nausea. I didn’t tell her about the Greek yogurts stashed all over my car or the likelihood that I would need to excuse myself to vomit at some point during our meeting. “Oh,” she sighed, as if something was wrong. “Oh,” she repeated, with a mild look of horror on her face. “How do you feel about that?” she finally asked. “Oh,” I echoed, and then started to vouch for my decision. “It’s a good thing. It’s wanted. It was planned. I have a partner. We’re happy together. We’ve been together for over 10 years. We had really thought about it, and…” My justifying continued at lightning speed until a little bird on my shoulder knocked me on the head. Stop it. You weren’t even asking for her opinion. You don’t need to defend yourself. What proceeded, though, was an hour of her thoughts on the motherhood she had not chosen: how being in a “playgroup” with other moms would be her personal hell, how she feels lit up by going to a place like Tibet instead of the “supposed adventure of motherhood,” how one of her editors once suggested that it would be impossible to be a mother and a writer, how she had had an abortion (unclear if the abortion was because of the comment), how she thinks only the most rare woman can be a successful writer and a mother. After learning my “with child” fate, she showed no interest in my book, or me for that matter. I wanted to say, But wait... I also want to go to Tibet, I also don’t want to be in playgroups, wait, wait, don’t put in me in a box. “Yeah, just a few, though,” she responded. “I have to believe it’s possible,” I said, over and over again, to which she said nothing. I realized she was older than me. I realized she was speaking from within a historical context of women having limited choices. But did she realize what she was suggesting? I believe all people are good at the core. I believe she is good. She and I were stars passing each other for a short afternoon and there was something for each of us to learn there. She was a teacher for me. When I dropped her back at the hotel, she offered to blurb my book or do anything to help. It was kind and I think she meant it, though it never did materialize. Later, she sent me a short email to apologize. This is the only way I knew then and know now that I wasn’t overreacting. I’m not sure what she learned from meeting me. But here’s what I learned: woman-to-woman violence is common, insidious, and layered. It’s the who does she think she is thing. When one woman, especially a feminist woman, tells another woman that she can’t be something simply because that first woman didn’t choose it or envision it for herself, or because her life structure didn’t allow for it, a small death occurs. This is the dark, often undiscussed underbelly of patriarchy. We have all done it. There’s a systemic internal rage; we are pissed; and we are trying to place that anger somewhere, anywhere. It’s easy to displace it onto other people, especially other women, because we operate with a built-in misogyny. She did it to me. She took her own recent wound, and the many injustices she has faced as a woman, and slapped them onto me. We do it to ourselves as well. That October afternoon, when the book festival ended, I drove three hours to get home. The light slanted low and buttery across the mountains. My internal dialogue steered me in and out of The Place of Consequence. I couldn’t undo my pregnancy at this point; nor did I want too. But the primary thought running through my brain was I’ve made the worst mistake of my life. I catapulted down the highway, wrestled with my fear, and made a vow. One day, if and when I became a “successful writer,” I would listen to young writers, listen, listen, listen, and definitely not make a judgment call regarding whatever life decisions they were making. I would ask questions. I would remove myself from their plots. Done. There’s a systemic internal rage; we are pissed; and we are trying to place that anger somewhere, anywhere. That October afternoon, when the book festival ended, I was an innocent. I could not foresee that my child's birth would lead to incontinence and pelvic floor issues, or that the two years postpartum would pummel me into a dark hole of thyroid disease, hormonal imbalance, and a rage so intense I wanted to destroy my marriage and my life. That October afternoon, when the book festival ended, I was a 33-year-old woman anticipating her first book and her first baby and assuming, hoping, it would all be okay. It is okay. Now. Four years later, I have two healthy daughters, a second book about to launch, and the promise of healing my own body ahead. This is cause for celebration, let me tell you. For the first year after that October afternoon, I got cagey whenever someone mentioned the writer's name, as if she were a lover who had backstabbed me. My cousin, who also spent her young adulthood immersed in this writer’s work, and who, it’s worth saying, does not want children, said with a small measure of humor, “She’s dead to me now.” My mother reminded me that every woman must be reconciled to whatever decision she makes about having kids. I only told my closest people about the exchange. I wasn’t interested in marring her name to readers I knew loved her. I wanted to let her be a human who had a mood, just like all of us, just like me. Sometimes, when I’m folding tiny laundry, I consider a redo. Where had my confidence gone that day? I would have said, “Please stop,” and redirected us to a more nuanced conversation. But a young lion gets intimidated sitting at the paws of a seasoned one. This is, of course, assuming she remembers our conversation. Maybe we would be able to lift each other up. You know, that image of one woman grabbing another by the forearm to yank her up, while the one being yanked is yanking another below her, and so on. You know, that image. And in so doing, we would consider the consequences of our words and then, only then, continue changing the world. 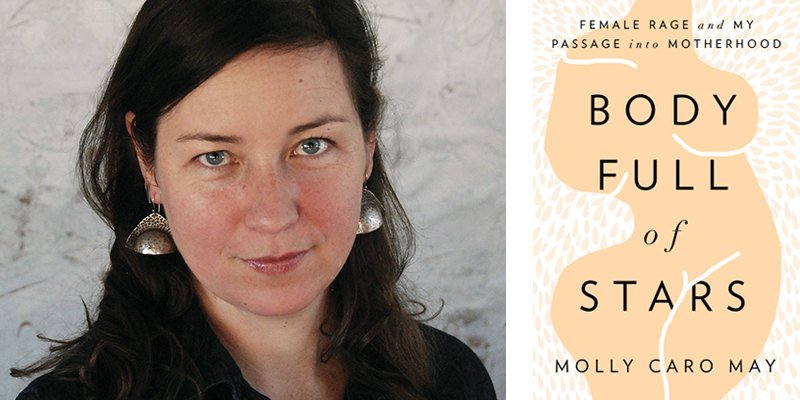 Molly Caro May is the author of Body Full of Stars: Female Rage and My Passage Into Motherhood and The Map of Enough: One Woman’s Search for Place. She lives in Montana. Please visit her at mollycaromay.com.